Our school’s set-up provides a totally immersive teaching environment and we pride ourselves on our commitment to deliver quality language tuition to all students. School • Accommodation • Facilities ‘all under one roof’ - The convenience of living and learning in the same building, minimising travelling time and costs while enjoying all the facilities offered by the school. An excellent opportunity to practise English outside the classroom in an international environment. "Amazing language school! Nice and very helpful staff and teachers. Very international, you'll be mee..."
This course provides effective training for students who need English for work, study or travel. Experienced teachers use a course book and supplementary material to help students produce and practice the four language skills. The aim of this course is to help students to communicate, and emphasis is placed on encouraging fluency and confidence in the English language. The enrollment rate will vary depending on the number of weeks of the course. For reservations between 1 and 7 weeks the registration fee will be 40EUROS. For reservations between 8 and 23 weeks the registration fee will be 70EUROS. For reservations for 24 or more weeks the registration fee will be 100EUROS. Students join the Standard Course in General English which allows them to practice all the language skills. The Intensive Course offers additional lessons which are devoted to speaking, where students wishing to focus on improving their oral fluency can discuss and debate a wide range of topics. The aim of this course is to help students to communicate, and emphasis is placed on encouraging their fluency and confidence in using the English language. The enrollment rate will vary depending on the number of weeks of the course. For reservations between 1 and 7 weeks the registration fee will be 40EUROS. For reservations between 8 and 23 weeks the registration fee will be 70EUROS. For reservations for 24 or more weeks the registration fee will be 100EUROS. An intensive course focusing on the English language requirements of two participants travelling together. Students are given personal attention and the lessons are designed to match their specific needs. The enrollment rate will vary depending on the number of weeks of the course. For reservations between 1 and 7 weeks the registration fee will be 40EUROS. For reservations between 8 and 23 weeks the registration fee will be 70EUROS. For reservations for 24 or more weeks the registration fee will be 100EUROS. This is an intensive course which is 100% focused on individual English language requirements and designed to match specific needs. This is the most flexible and personal course available that will quickly help students achieve greater fluency and accuracy in using the English language. The enrollment rate will vary depending on the number of weeks of the course. For reservations between 1 and 7 weeks the registration fee will be 40EUROS. For reservations between 8 and 23 weeks the registration fee will be 70EUROS. For reservations for 24 or more weeks the registration fee will be 100EUROS. The IELTS Classic exam preparation course is designed to improve the student’s overall language ability in addition to developing the language skills necessary to pass the exam. Experienced teachers provide complete and careful preparation for all aspects of the examination and include practice interviews and mock examinations under authentic exam conditions. The enrollment rate will vary depending on the number of weeks of the course. For reservations between 1 and 7 weeks the registration fee will be 40EUROS. For reservations between 8 and 23 weeks the registration fee will be 70EUROS. For reservations for 24 or more weeks the registration fee will be 100EUROS. Smaller classes ensure more student-teacher interaction and will accelerate the learning process. Experienced teachers plan lessons to include a combination of speaking, listening, pronunciation, reading, vocabulary building, writing and grammar. The aim of this course is to provide practice in using language and grammar in a wide range of situations, developing the skills and vocabulary that help students to become more effective speakers. The enrollment rate will vary depending on the number of weeks of the course. For reservations between 1 and 7 weeks the registration fee will be 40EUROS. For reservations between 8 and 23 weeks the registration fee will be 70EUROS. For reservations for 24 or more weeks the registration fee will be 100EUROS. An Standard Course in General English for smaller groups ensuring maximum participation and interaction in class. Lessons include a mixture of speaking, listening, pronunciation, reading, vocabulary building, writing and grammar. Students also join fluency lessons that are designed to develop practical communication skills leading to greater fluency in everyday English. The enrollment rate will vary depending on the number of weeks of the course. For reservations between 1 and 7 weeks the registration fee will be 40EUROS. For reservations between 8 and 23 weeks the registration fee will be 70EUROS. For reservations for 24 or more weeks the registration fee will be 100EUROS. The houses are situated across the road from the school and consist of modern shared bedrooms and bathrooms and a shared kitchen. This budget accommodation is ideal for those who would like to experience student life to the full. The hostel is situated across the road from the school and consists of modern bedrooms with private bathrooms and a shared kitchen. It is ideal for persons who would like to enjoy student life but want the privacy of their own bathroom. 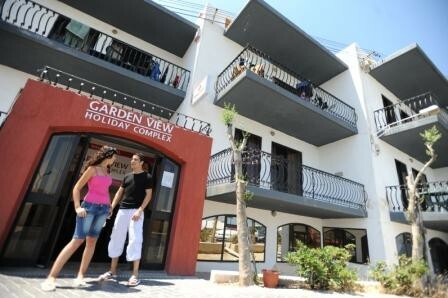 The hostel can be booked as either single, twin or shared bedroom (maximum 3). All our English-speaking host families are situated within walking distance of the school. They are all carefully selected and are ideal for students who would like to reside in a family environment, experiencing the Maltese way of life. This type of accommodation is situated within the same building as the school and is ideal for students who would like to share their apartment with other students. Shared apartments can be booked as either single, twin or shared bedroom (maximum 3). This type of accommodation is situated within the same building as the school and is ideal for students who would like to share their apartment with other students. Shared apartments can be booked as either single, twin or shared bedroom. Residence Apartments are situated across the road from the school and have 3 or 4 bedrooms. The apartment includes three or four bedrooms, two or three bathrooms, a kitchen, a TV and telephone (all shared with other students). Weekly cleaning and change of bed linen and towels are also included. These budget apartments can be booked as either single, twin or shared bedroom (maximum three students). - A cancellation fee of € 150.00 applies when a course is cancelled less than 4 week/s before the course commencement date. Most recent booking for this school was from Ivory Coast and saved €56.25!